A winner’s brain and achievement often has little to do with a person’s IQ, money, circumstances, knowing the right people, or luck. The Winner’s Brain by Jeff Brown and Mark Fenske instead hypothesize that a winner’s brain comes from creating a brain that is resilient to failure. 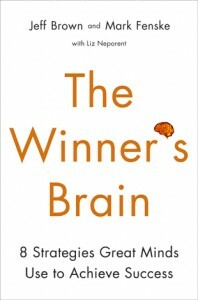 The book and its authors suggest that your brain can be trained into a winning on. Through interviews with celebrities and everyday folks, Brown and Fenske lay out a framework for unlocking your brain’s hidden potential. Part One – A Tour Of The Brain. This book was written by a clinical psychologist and a neurologist, and the first portion of the book reads exactly like you would expect from a psychologist and a neurologist. The authors share with the reader key terms about the brain and its anatomy, a short history of neuroscience, and common traits of a winner’s brain. This part of The Winner’s Brain is very dry and not very interesting for a layman. But, the book picks up steam. Part Two – The 8 Winning Factors. Part two is the real meat of the book. It covers steps and tips to developing your winner’s brain. Part two covers how you can enhance eight different key traits and how to harness your brain’s function in certain tasks. The 8 winning factors are self-awareness, motivation, focus, emotional balance, memory, resilience, adaptability, and brain care. I won’t spoil the book for you, but I will share with you’re a couple of my favorite tips from the second half of The Winner’s Brain. The authors insinuate that luck is a characterization of motivation and being goal oriented. In essence, those with a winner’s brain make their own luck thanks to their hard work, dedication, and incredible motivation. Brown and Fenske recommend that you reduce your tasks into smaller chunks to stay motivated. They also discuss several studies that were conducted using the color red. Needless to say, we all should avoid red at all costs with its negative cogitations. The book also discusses how people should also focus their energies on internal motivations instead of external ones. For example, smokers may originally quit smoking if there is a monetary reward, but the internal satisfaction of increasing their lifespan and health will quickly outpace any monetary rewards. Who Can Benefit From This Book? Anyway can benefit from reading this book if they are looking for a psychological edge to get over the hump. When you think that you have reached a plateau, reading this book can help give you some tips on how to train your brain to breakthrough to a new level. This book reminds me a lot of Seth Godin’s The Dip but with far more science. Do not get me wrong. This book is a rough read with a lot of research that has gone into making it and supporting its claims, but it may well be worth your time to at least skim it. What Does This Have To Do With Money? Everything! That’s what! Making money and investing it is a mental exercise. And, we should all be looking for better ways to harness the power of our brain. The Winner’s Brain teaches you how to get more out of your most powerful muscle. With the tips, techniques, and ideas in this book, you can get more out of your career and your money.